YAR! 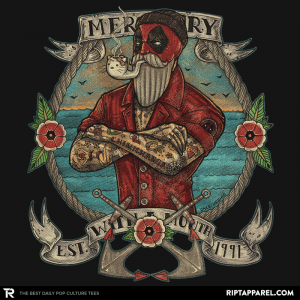 Deadpoolbeard here to hoist ye scurvy-ridden bastards on the gangplank! I don’t really know that much pirate talk, but just pretend I’m a really scary pirate blogging some clever nautical insults at you. Oh, yeah, this really is Deadpool. I’m everywhere. Blah blah blah so metta yadda yadda yadda, yeah I know. Sorry, it’s my shtick. It’s what I do. Hey, did you see my movie!? So cool, right? I’m working on another one, but it’ll take awhile, I think. Studio execs work a lot faster with a katana at their back, but it’s still SOOOO SLOOOOOWWWWW!!! Anyway, what am I supposed to be doing? Oh, yeah, this T-shirt. I’m not a fan of T-shirts, really. I prefer red Kevlar. But get a load of that beard! Wearing this shirt is worth it just for the beard. Get it! Get it now! Or else.